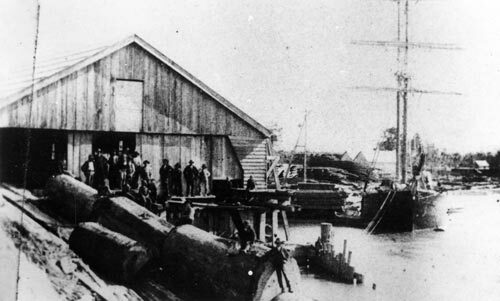 Around 1880 the Helensville Timber Company built a large mill on the Kaipara River at Helensville. Some of the 50 employees are pictured here on the log-slip. Logs were towed along the river and then pulled up the slip to be sawn. Some of the timber was taken by rail to Auckland, but most was shipped to Australia. In 1886 the company was taken over by the Kauri Timber Company, which closed the Helensville mill in 1890.